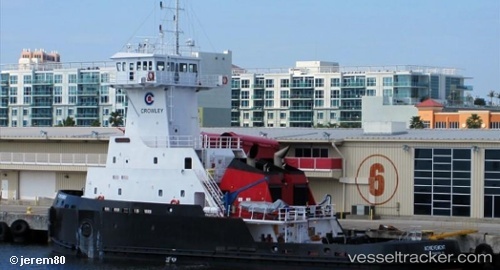 The crew aboard the tug-barge "Achievement/650-8" recently rescued an injured man who was struggling to stay afloat near the base of the Sunshine Skyway Bridge in Florida’s Tampa Bay. As the 587-foot tug-barge transited the bay, the on-watch crew noticed a man bobbing in the water on the port side of the vessel about the same time that the St. Petersburg Coast Guard issued emergency radio calls. One crewman responded by immediately throwing the man a life ring. The master sounded the man-overboard alarm. Putting their emergency and safety training to use, the Crowley crew readied a rescue boat for deployment while he slowed the barge to ensure that the boat was launched safely. Once in the water, the rescue boat, manned by two crewmembers, motored toward the man, who by then had drifted nearly a mile and was calling for help. Despite windy conditions and rough chop, the crew managed to pull the badly injured man from the water in less than eight minutes from the initial sighting and wrapped him in a blanket until a St. Petersburg Fire and Rescue boat arrived to provide other lifesaving treatment. During the emergency, the master worked with the Tampa Bay harbor pilot who helped the crew perform the slowdown procedure, remained in communication with the Coast Guard and ensured that the barge remained out of danger by avoiding oncoming vessel traffic and keeping it well within the commercial shipping. After the rescue, the "Achievement/650-8" safely entered Tampa Bay to deliver a load of fuel at the Port of Tampa.